What do you do now and what are you planning for the future? 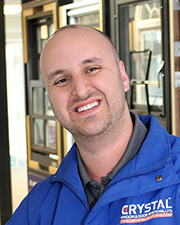 I am an account executive for Crystal Windows, serving fenestration and building trade professionals on Long Island, NY, as well as select national accounts. I consult with architects, GCs, and property owners on their new construction and renovation projects to supply the right fenestration product for the application. I have always been in a sales-oriented job and plan to continue in sales into the future.